Okay. 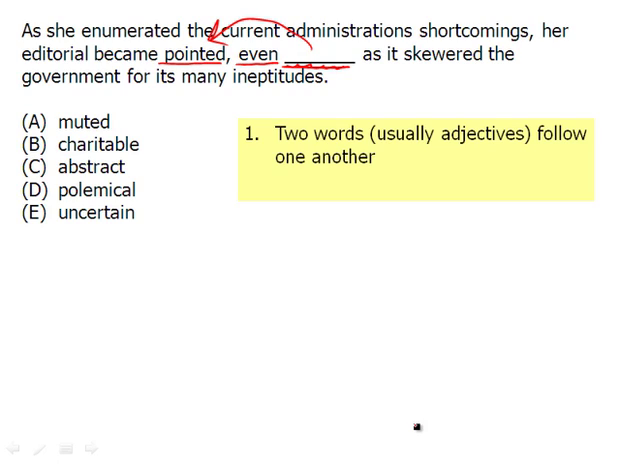 In this video, we're going to be dealing with a sentence where there definitely isn't a shift, and there's a similarity that is important to note. This is called an apposition, where you have two words that are next to each other. In this case, we have pointed, even _____. So when you're dealing with these two words that are next to each other, they usually tend to be adjectives. Again, they follow one another. It's called apposition, and of course you don't have to know, but what you do know is that the second word here in the blank itself is going to be similar to pointed, but it's also going to be more extreme because of that word, even. Sometimes, that word will be there. Other times, it won't be there, and in that case pointed--this word here--would probably be more of a synonym but now with even, we are looking for a more extreme word, so let's read the sentence. "As she enumerated the current administrations shortcomings, her editorial became pointed, even _____, as it skewered the government for its many ineptitudes." This sentence is a little bit harder than the other one. Part of the reason why is the words. Enumerated. Enumerated means to list out, one by one. Again, you don't really have to know this to get the sentence right because all you really need to know is this word here, pointed. And if a criticism is pointed, it's definitely exact, and it's marked by the person speaking in such a way where they want the other person to know that, "Hey, you're being criticized." My criticism is pointed, but we want to take it even further, and that's why we need a word that's even more than just overtly critical. We want something like, "OK, I am upset with you government, you government full of you ineptitudes or shortcomings." And again, if someone is inept or is filled with ineptitudes, they're no good at what they do. So, what's that word that's a more extreme version of pointed? Well, let's look at muted. Muted. Again, of course, we want to make sure here that the words are similarly related, and muted is the opposite. You're quiet in your criticism. Charitable--you're kind. That's definitely the opposite of what's going on as well. Abstract--you're vague. Polemical. Hmm, mystery word. Uncertain. Well, she was pointed. She was pretty certain about how she was criticizing her, so we need an even more extreme word. That's not going to work, and again you see that word you don't know is the answer. A polemic is an impassioned argumentative attack on something, usually. In this case, a polemical is adjective form of polemic or polemics, which would be a noun, and here the controversy, of course, is the government and its ineptitudes, and this person is speaking out in a harsh way against the government. That word is polemical, and that's how the sentence functions. So the good news is if you know this word, you know the apposition, the even some sort of extreme. You don't have to know all these other words. You really don't even have to know what the sentence is saying. You could still get the answers, so that can definitely be helpful on some of these text completions.